FORT LAUDERDALE, Fla. (CitizenWire) — To coincide with its twentieth anniversary, LMR International this week announced the launch of its comprehensive, all-inclusive contact management software – CRM Sales Machine. “The concept of all-inclusive software has been around for many years,” says Lorenzo Rodriguez, president LMR International. The CRM Sales Machine has an array of practical features that include: contact management, lead generation, financial, marketing, and e-commerce capabilities. This new database software easily replaces five to 10 software systems in one. It has integrated accounts receivable and payable systems; check draft printing; a telemarketing system; competitor analyzer; integrated bank system for unlimited banks and accounts; template manager; survey creator system; and much more. CRM Sales Machine is MS Windows-based for speed, security and convenience. It interfaces with the Internet and is able to import items and can also post contacts to be viewed by iPhones, Blackberries and any other Internet devices. For example, a products section for invoicing inventory, catalog creation and the ability to upload a full Web store is one of the many features offered. CRM Sales machine is priced at $49.97 per month – the same price level of less-featured CRM software. To date, LMR International, Inc. has directly marketed its products, but is now seeking U.S. and international distributors for this new software. 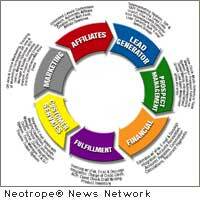 For more information about the CRM Sales Machine, visit: www.CRMSalesMachine.com . A complimentary, not-for-resale (NFR) full copy of CRM Sales Machine is also available to accredited media via e-mail at: Lorenzo@LMRinternational.com . LMR International, Inc. is a software development company that markets Credit Money Machine Net and Loan Modification Machines – the standards in credit repair and loan modification software. News Source: LMR International, Inc. :: This news story was first issued by and is Copyright © 2010 the Neotrope® News Network – all rights reserved. Originally published on CitizenWire™. Florida, Fort Lauderdale, LMR International, Inc.